There is a wealth of work experience among the ten candidates running for Berkeley Council seats in the November 6 election but several stand out as examples of our changing lifestyles. In addition to "a small business owner" and an "attorney," our candidates include an "elder nutrition manager," a "sustainable policy analyst," a "green transportation designer," and Aidan Hill who lists his occupation as "Berkeley Dog Walker." Trump's "America First" to Planet Earth: "Drop Dead"
Donald Trump has announced he's a "nationalist," not a "globalist." Why worry about the planet, when your focus is on America uber Alles? This raises the obvious question: "What planet does Trump think he lives on?" When the UN's International Panel on Climate Change (IPCCC) released its report warning that humanity had only 12 years left to clean up its act or face global disaster, Trump claimed he was unconvinced because, "I can give you reports that are fabulous, and I can give you reports that aren't so good." Trump, who has a notorious aversion to reading anything longer than a two-page briefing paper, promised to review the IPCC report saying: "It was given to me, and I want to look at who drew it." Apparently Trump thinks the IPCC report is a comic book. After two weeks of excuses and avoidance, Donald Trump was finally forced to concede that his Saudis partners had, indeed, plotted to kill and dismember a journalist—and repeatedly lied about it. But Trump's confession had a strange ring to it. He didn't criticize the murder or the dismemberment. Instead of condemning the crime and the attempted cover-up, he critiqued the execution's poor execution. "They had a very bad original concept," Trump told reporters. "It was carried out poorly and the cover-up was the worst in the history of cover-ups. They had the worst cover-up ever." Trump left the impression that he must know a thing or two about cover-ups. Presumably, had he been in charge of Jamal Khashoggi's assassination, he would have ordered "a very good, really fabulous, actually, concept" that would have been "carried out terrifically" thanks to "the very best cover-up in the history of cover-ups." By leaking evidence of Saudi Arabia's conspiracy to murder Washington Post journalist Jamal Khashoggi, Turkish President Recep Tayyip Erdogan sounded like a champion of human rights and press freedom. Don't believe it. In its 2017 annual report, the Committee to Protect Journalists found 262 journalists had been slammed into prisons for doing their jobs—up from the 2016 historical high of 259—and the three worst jailers of journalists were Turkey, China and Egypt who were responsible for jailing 51 percent of the total. "California's Underwater Forests Being Eaten by 'Cockroaches of the Ocean'"
Did Trump's Lies Provoke Would-be Bomber? On October 22, Donald Trump tweeted the falsehood that "Criminals & unknown Middle Easterners are mixed in" with the caravan of refuges fleeing violence in Honduras, Guatemala and El Salvador. Terrorists "could very well be" among the group, Trump later told reporter. "I think there's a very good chance you have people [meaning terrorists] in there." At a campaign rally in Montana Trump unleashed another lie: that Democrats were behind the migrant caravan from Central America. So put it together: If the Democrats are behind the "caravan" and the caravan is providing cover for "criminals," "gang members," and Middle Eastern "terrorists." Ipso facto, the Democrats are conspiring to invade and attack America. Ergo, the Democrats are the Enemy and they must be attacked and destroyed. Donald's foreign adventures took him to lands where impoverished people always spoke in fractured English, behaved like naïve children and were easily manipulated by promises of wealth, food or magic. 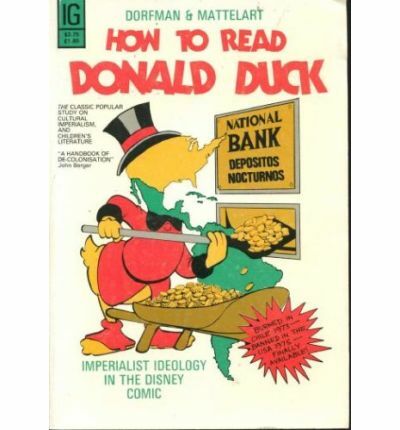 When Donald wasn't tricking the "natives" to earn some duckets for his capitalist sponsor, Uncle Scrooge McDuck, he's conspiring to win the favor of local overlords by thwarting oppressed locals. How to Read Donald Duck is filled with frames reprinted directly from the comic books. In one frame, Donald and his nephews, Huey, Louis and Dewey, are shown setting a trap for "the revolutionaries" in order to "save the king." In the next frame, the insurgents are shown tied in ropes while a paunchy, mustached man in a business suit and a crown marches in grinning as Donald quacks: "Ha! Ha! When Donald's at work, you better watch out, you bandits." This is just a hint of the nefarious hi-jinks of Disney's favorite duck. The Dorfman-Mattelart analysis was a big hit—until the US-backed coup toppled Allende (on September 11, 1973) and installed the brutal military dictatorship of Augusto Pinochet. Pinochet ordered all existing copies of the book to be burned. A new third edition was seized and the Chilean Navy was instructed to dump them all in the ocean. In 1975, when 4,000 copies of a new edition, translated into English, was shipped to the US, Disney's lawyers had the entire shipment impounded. Only 1,500 copies ever made it into the hands of American readers. Eventually translated into 17 languages, the book sold more than a million copies worldwide but no US publisher dared to touch this global best-seller—until now. An odd sight on Harold Way on Wednesday morning. A Berkeley City employee power-washing a stretch of sidewalk frequently used by tent-camping homeless residents, paused to redirect his high-powered spray over a white four-door parked on the curb. He then returned to cleansing the cement. The vehicle's owner must have been pleasantly surprised—not to mention baffled. The militarization of American conversation is extensive and insidious. A recent dispatch from an unnamed nonviolence center on the East Coast began by praising California Rep. Ro Khanna for introducing H. Con. Res. 138, the House War Powers Resolution, which calls for ending US military support for the brutal Saudi war against Yemen. The email then goes on to salute activists who "remain in the peace and justice trenches" and "continued to pound the drum" while urging Dem minority leader Steny Hoyer to "whip up other legislators" to invoke the War Powers Act.